This cultural and religious celebration can’t be ignored. 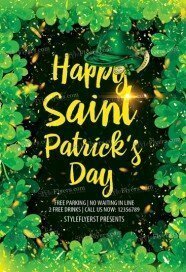 We create our new free St. Patricks Flyer PSD templates listing for those clients who want to promote their events for free with the help of high quality products. 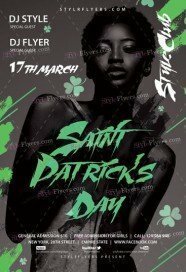 In this category, we represent only the best PSD samples which can help you to promote your thematic parties. Get free St. Patricks Flyer template and start its customization. 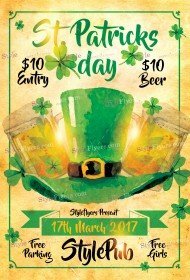 You can customize any part of the flyer and implement any of our ideas. Create the perfect invitations for your event a with the help of our printable St. Patricks Flyer templates. You can download for free any of our Photoshop files. We try to update this category each weekend, so if you didn’t find the appropriate variant for your event, just watch our updates and wait for some new PSD files. 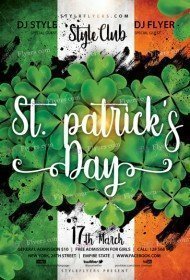 It doesn’t matter which exact file you will pick, you can order for any of them a Facebook cover for additional social media promotion. We will create a cover with the similar design and more appropriate dimensions for social networks. 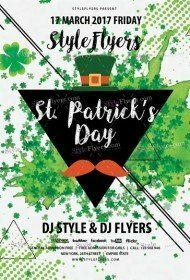 Start celebrating a St. Patcrick’s day with the help of professional designers from the Styleflyers Company. We will make your advertisement more effective.